Kamen Rider X Kamen Rider Super Movie Wars Genesis - Kamen Rider Dead Heat Drive & Shaman VS The Chief? 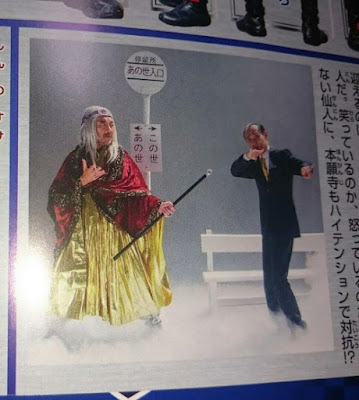 Check-out some of these magazine scans featuring Kamen Rider Drive's "new" form and what seems to be scene from the movie featuring Shaman and the Chief. Besides Kamen Rider Zero Drive, Shinnosuke will transform into Kamen Rider Dead Heat Drive after receiving a new Mach Driver from Dr. Harley. And on this scene above, looks like The Chief and Shaman will meet in the afterlife. Could this mean that the chief died for a moment or is this a dream sequence? 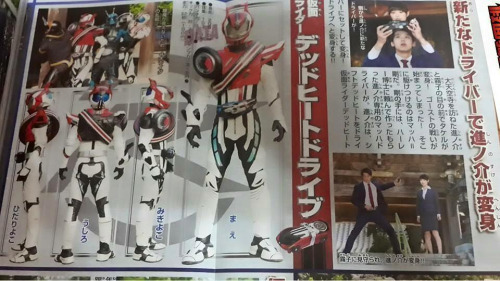 I feel like a better use would've been to have Shinnosuke held on to the Tridoron Key and just have him go Super DeadHeat.